Saint Alphonsa was a Sister from the Central Part of Kerala. Though she was chained down by frequent bouts of illness, Sister Alphonsa was interested in doing the charitable work of improving the living standards of the people around her, especially those who were afflicted with body deformities. Hence, many people with body deformities such as clubbed feet have benefitted from her divine interventions. Saint Alphonsa was a Sister who lived in the beginning of the 20th century. She followed Syro-Malabar Catholic Franciscan Religious Order when she was alive. Alphonsa was beatified in the year 1986 and was elevated to the level of a saint in the year 2008. After her canonization, Alphonsa became the first woman of Indian Origin to get elevated to the level of a saint by the Catholic Church. With the canonization, she became the first individual from Syro-Malabar Catholic Franciscan Religious Community to get this distinction. Incidentally, the Syro-Malabar Church is an Eastern Catholic Church of the Saint Thomas Christian community that is prevalent in the hilly areas of Idukki district of Kerala state. Alphonsa was born as the fourth child to Cherian Ouseph and Mary Muttathupadathu in the year 1910. She was baptized in the same year on August 26 as Anna Muttathupadathu. Her birth place was Arpookara village. This is a small village in Kudamalloor, near Kottayam, Kerala. This place lies within the Archdiocese of Changanacherry. During her childhood days, Anna was fondly referred to as Aphonsamma by the local people. When she was young, Anna lost her mother, and hence she was looked after by her maternal aunt. She had her formal and religious education under the able guidance of her great-uncle Father Joseph Muttathupadathu. Since Anna was from a rich and prosperous family, many marriage proposals had come from the reputed families of the region. In fact, her foster mother wanted her to become a perfect housewife in a rich household. Because of her unwavering belief in Jesus Christ, she decided to forgo all the material benefits of inheritance and marriage that were ready to get showered upon her. Later in 1916, Anna started a school to uplift the living standards of children in her native village. After a year since the starting of the school, she received her First Communion from the Church near her native village. In 1918, she was transferred to a school in Muttuchira, a village nearer to her native. While working in the same school in 1923, Anna accidentally fell into a pit of burning chaff and got her feet burnt. Due to this accident, she became permanently disabled. According to the legends doing rounds in the region, this injury was self-inflicted by Anna to avoid the attempts by her foster mother to get her married to a man from the rich family household. After this incident, she became a religiously conscious woman, devoting more time to do humanitarian works to reach the lotus feet of Lord Jesus. After a brief period of indecision, she decided to join the Franciscan Clarist Congregation, a religious group of the Third Order of Saint Francis. Later in 1927, she arrived at the Clarist Convent of Bharananganam and received the postulant's veil there on an auspicious day. While receiving the postulant's veil, she took the name of Alphonsa of the Immaculate Conception in honor of the great Saint Alphonsus Ligouri. Immediately after changing her name in the honor of Saint Alphonsus, she began to work as a Malayalam language teacher in High School at Vazhappalli. During this period, she completed her studies in Christian philosophy and entered the novitiate of the Congregation of Bharananganam. This was the first step she took in the direction of becoming a Sister with the religious congregation at Bharananganam. By 1931, she completed her novitiate and took her first vows to become a nun. As Sister Alphonsa, she took her permanent vows in the year 1936. The general health of Sister Alphonsa began to deteriorate after 1930. Due to the frequent bouts of illness, she had to cut short her services at Changanacherry and return to Bharananganam to take up a teaching job at Saint Alphonsa's High School. While teaching at the school, she had to take frequent breaks from the classes due to her illness. According to some people in the Clarist Congregation, she was cured of her illness for a period of three years by the intervention of Kuriakose Elias Chavara. By the beginning of 1939, she fell back into the troubled waters of illness due to the severe attack of pneumonia. Since then, Sister Alphonsa's health had continued to deteriorate slowly. However, in 1941, her general health condition improved. For about 4 years since 1941, she progressed well in the health front responding to both medical and religious interventions. In 1946, her health condition began to turn worse due to stomach problems and ensuing vomiting sensations. She died of this illness on July 28, 1946 at Bharananganam. On the very next day, she was buried at Saint Mary's Syro-Malabar Catholic Church in Bharananganam. The claims of the divine interventions by her started propping up a year after her death. Strangely, these cases involved the children of the convent school where she used to teach before her death. After carefully studying the cases, the authorities of the Church decided to beatify her. As a result, Cardinal Tisserant inaugurated the process for Sister Alphonsa's beatification in the year 1953. After a long wait of 32 years, Pope John Paul II officially approved a miracle attributed to her intercession in 1985. In his speech, he called her as "Venerable Sister Alphonsa". After this, she was beatified along with Reverent Father Kuriakose Elias Chavara in 1986. According to the authorities of the Catholic Church, there are many instances of people getting benefitted from the divine intervention of Venerable Sister Alphonsa. Many of these claims involved the cases of people with foot deformities. These people have put on record their cure after they prayed to Venerable Sister Alphonsa. Two of these cases were submitted to the Congregation for the Causes of Saints as proof of her miraculous intervention. After the thorough scrutiny, the Congregation for the Causes of Saints has finally put its stamp of approval on these cases. On October 12, 2008, Pope Benedict XVI announced her canonization at a meeting in Saint Peter's Square. In that canonization ceremony, many people from India had participated, including a boy from Kerala whose clubbed feat was healed by Sister Alphonsa when he prayed to her in 1999. Sister Alphonsa was a Sister with Syro-Malabar Catholic Franciscan Religious Congregation. After canonization, she became the first woman of Indian origin to get the sainthood. The claims of miraculous intervention by Sister Alphonsa began to come up a year after her death. These claims mainly involved the children in the convent school where she used to teach before her death. Two of such claims were taken up for cross verification by the Congregation for the Causes of Saints. For cross verification purpose, the medical opinions were also sought from reputed Medical experts. After the complete and thorough scrutiny of these claims, the Congregation for the Causes of Saints gave its official stamp of approval. Based on these approvals, Pope Benedict XVI announced her canonization at a meeting in Saint Peter's Square. 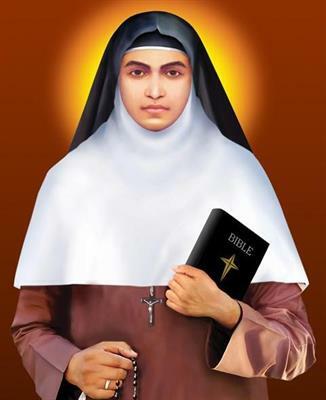 Prior to this, she was beatified along with Reverent Father Kuriakose Elias Chavara.